After all of the votes were counted, Esthetics by Caris was voted the Best Esthetician in Wake Forest in 2017, 2016, 2015, and 2014! To all of my clients – Thank You! I could not have done it without you. The Wake Weekly’s “Best of the Best” not only puts a spotlight on community business, but it also allows newcomers a chance to visit places that the locals have already deemed worthy of recognition. Winners of the Best of the Best contest are recognized at an awards ceremony and in a special section of the newspaper. 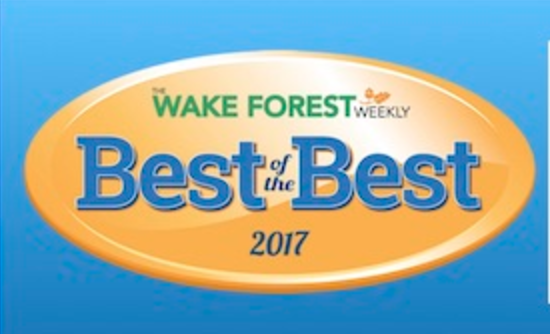 To say that Diane, owner of Esthetics by Caris, is flattered to be chosen the 2014, 2015, 2016, and 2017 Best of the Best Esthetician in Wake Forest is an understatement. She is, and remains, very grateful and honored and thanks each and every one of her clients.